Snorkeling is best on the southern end of the island during the winter and best on the northern end during the summer. Boogie boarding is something no one should miss. Get the feel for it in the surf off Kiahuna (if you rent fins, you’re sure to catch twice as many waves) or, for a bigger challenge, try Poipu Beach Park. Below we have listed the most popular beaches and a few details that will make visiting easy. Enjoy! 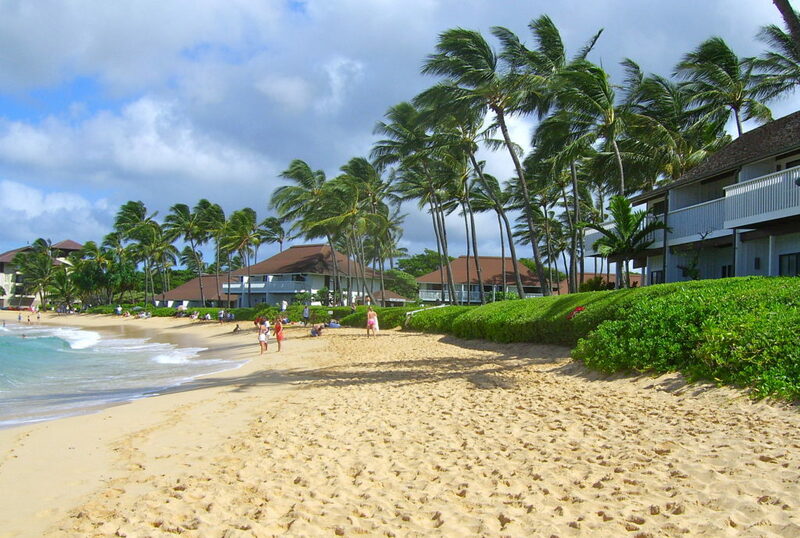 Is a section of Poipu Beach, a popular beach on Kauai’s sunny south shore. Kiahuna Beach fronts the Kiahuna Plantation condominiums and falls between Poipu Beach Park and Lawai Beach. Kiahuana is good beach for beginning surf lessons, snorkeling and boogie boarding. Thanks to the outlying reef the waters stay relatively calm. On the outside of the reef experienced surfers ride the waves. Stay close to shore if you are a beginner surfer or body-boarder. There is not a lot of shade so bring your umbrellas. Parking is limited but available at Poipu Beach Park. Is actually two beaches in one. A tombola (known as Nukumoi Point) separates the two bays. A tombola is a narrow sand spit that extends from shore to an island. The tombola at Poipu Beach is the favorite spot for the napping , endangered Hawaiian monk seals. The area on the western side of the beach, is a favorite for beginning body boarders. Small waves break gently on the shallow sandbar and create a fun area for children to play. On the left of the sandbar is a lava rock protected and shallow area for swimming. This is usually the play area for families with small children. 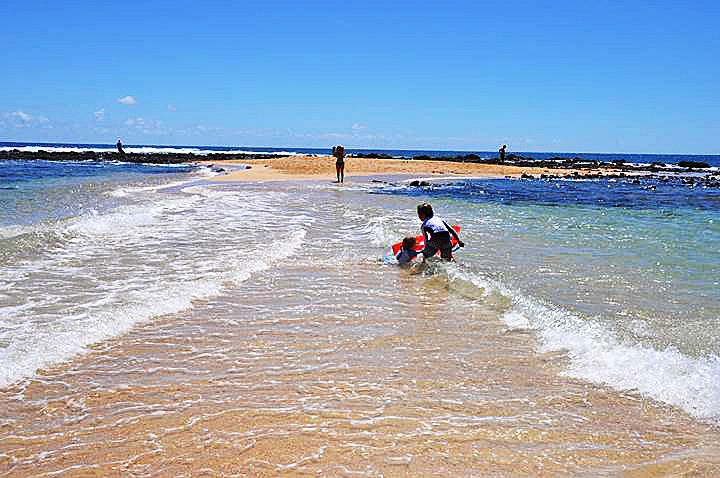 Poipu Beach Park has been voted the #1 beach in America. During the weekends this is a favorite spot for birthday parties, picnics, lawn games and family activities. The outdoor playground was built by donations from the community. You can find parking , snorkel rental and surfboard rentals near by. is a popular and picturesque beach and the subject to many postcard and gallery images. This long stretch of white sand beach was made famous by Hollywood when Mitzi Gaynor spent her time on this beach washing that man right out of her hair, in the movie South Pacific. Lumahai is the subject of many postcards and paintings, but is also known on island as one of the most dangerous beaches for drownings and is not recommended for swimming. During the summer months the conditions at Luimahai are calmer, but still use caution. Lumahai is exposed to open ocean and strong currents. Do not underestimate the power of the waves, currents and backwash. Enjoy you walk on the beach and your many opportunities for great photos. 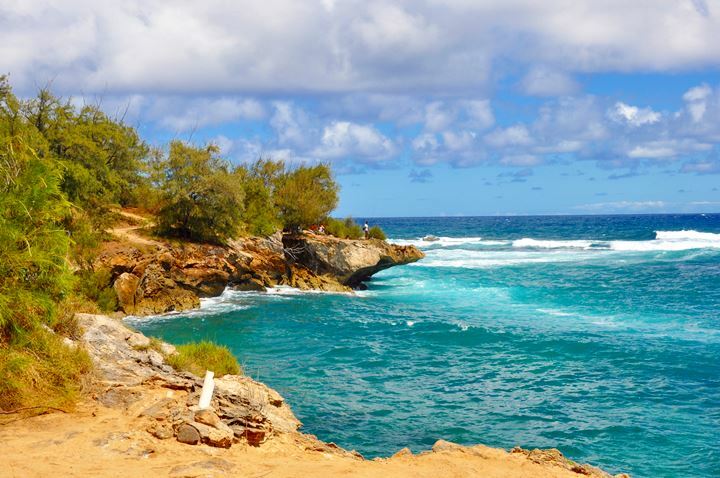 Great photo opportunities of Lumahai Bay can be had at the scenic lookout from the main road above the beach. Is a slice of heaven where lush tropical jungle meets white sand beaches and turquoise waters. The popular and very recognizable Mount Makana (Bali Hai) looms mysteriously above Haena Beach and offers a spectacular backdrop for sunsets and photo opportunities. 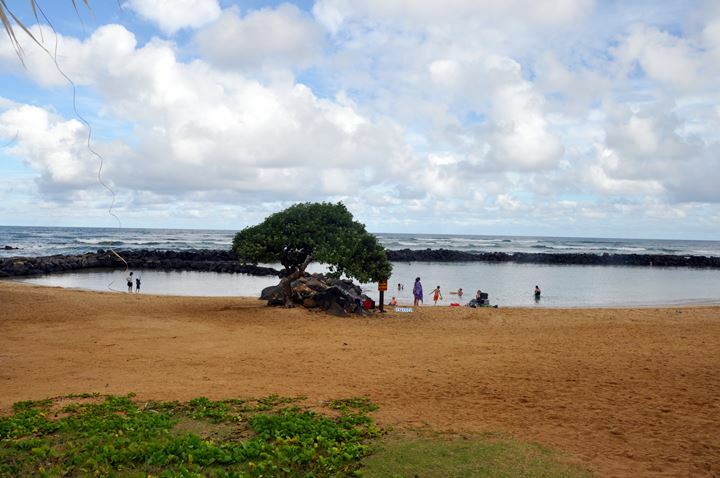 Haena Beach Park offers good swimming and snorkeling during calm conditions. This is a fun beach to explore and do a bit of beach-combing and great shell collecting. During the winter months the surf can be extremely large causing dangerous shore-break and strong currents. You can watch from shore as experienced water-men and women ride these awe inspiring giant waves. Haena Beach Park has a lifeguard station, restrooms showers and camp sites. Camping permit only. One of the popular North Shore attractions the Maniniholo dry cave is across the street from Haena Beach Park. Is located along an isolated and windswept coast this magical stretch of coastline is so deserving of preservation. The Mahaulepu Beach Heritage Trail leads you from the East end of Shipwrecks beach along a coastline of sand dunes, lava tubes, tide pools and stretches of white sand beaches perfect for beach combing. Mahaulepu Beach is better suited for the experienced swimmer and snorkeler. Stronger trade winds on this stretch of coastline make it a haven for wind surfer and experienced kite-boarders. This section of coastline includes a variety of landscapes to explore including; lava tubes, sandstone cliffs, blow holes and isolated coves make this a fantastic place to discover on foot. Tread lightly as you discover this sacred part of the island. Always pack out what you brought in. To learn more about the preservation of Mahaulepu Beach contact Malama Mahaulepu, a nonprofit working to protect the area. 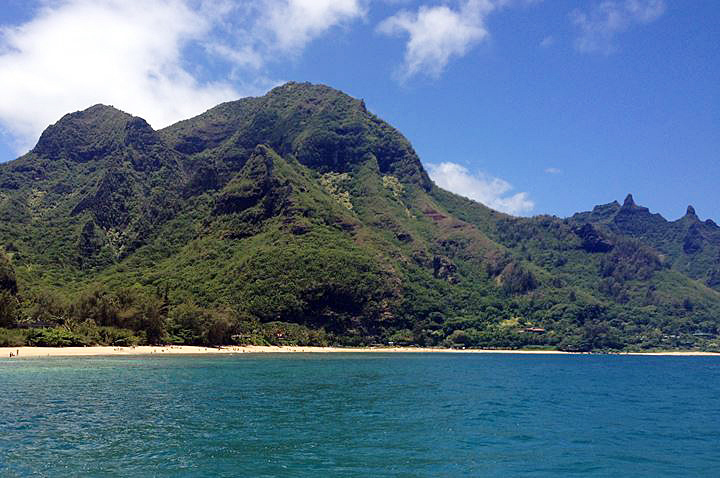 Is located on the East side of Kauai adjacent to the Wailua River. The two rock enclosed ponds create a safe haven from the open ocean waves, while still allowing the small reef fish to move into the pond through the crevices. This spot will almost guarantee that you will see a variety of tropical fish. The protected calm waters, posted lifeguard and variety of fish make this the perfect beginner beach for snorkeling. 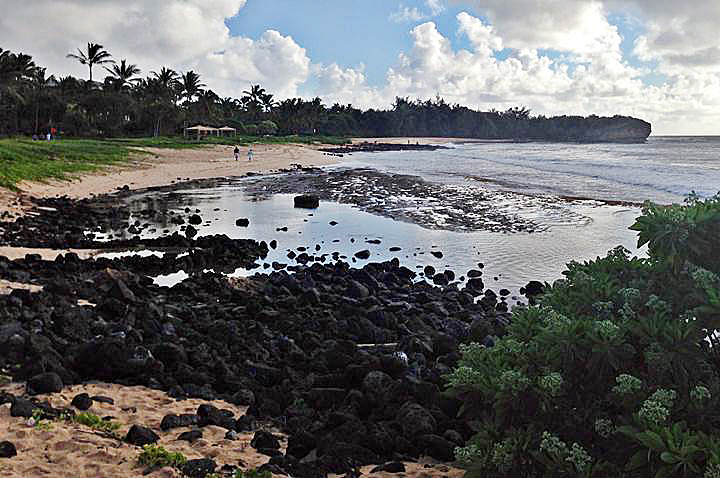 Lydgate State Park is a great family beach for swimming, picnicking and snorkeling in two protected lagoons. Lifeguards, full facilities, picnic areas, Kamalani Play ground and the 2.5 mile paved coastal path makes this a great choice for the whole family. Is a local favorite for surfing and body surfing. Located in front of the Grand Hyatt Hotel, parking is just beyond the hotels main entrance. Large surf usually pounds the shore and makes for difficult swimming and boogie boarding. Here is also where you can find the start of the Mahaulepu Heritage Trail, a great hike to explore the otherwise inaccessible coastline. Strong shore break can makes this beach a dangerous spot to swim. Best for beachcombing and sunsets. Is a small strip of beach fronting the Lawai Beach resort and the Beach House Restaurant. Not visible at high tide and better suited for snorkeling in calm weather. This is a favorite spot to watch experienced surfers off this reef break. 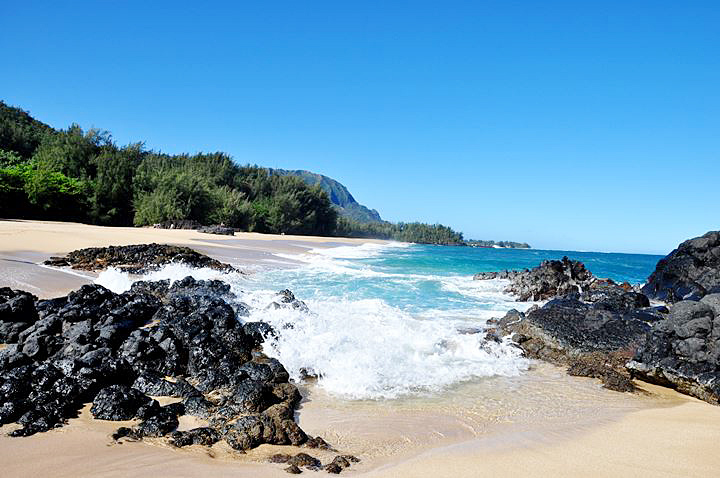 Lawai Beach is also popular for spotting turtles and the rare Hawaiian monk seal. Lawai Beach is also great for capturing the sunset. 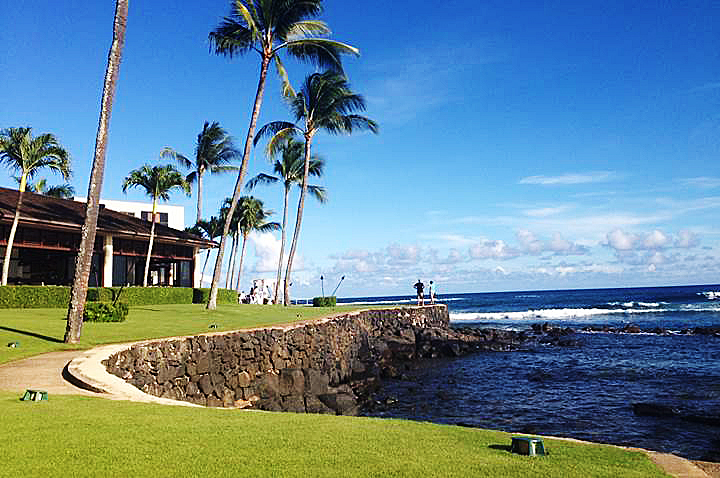 Located across from the Lawai Beach Resort and adjacent to the Beach House Restaurant. Is by far the longest stretch of beach in the state of Hawaii. 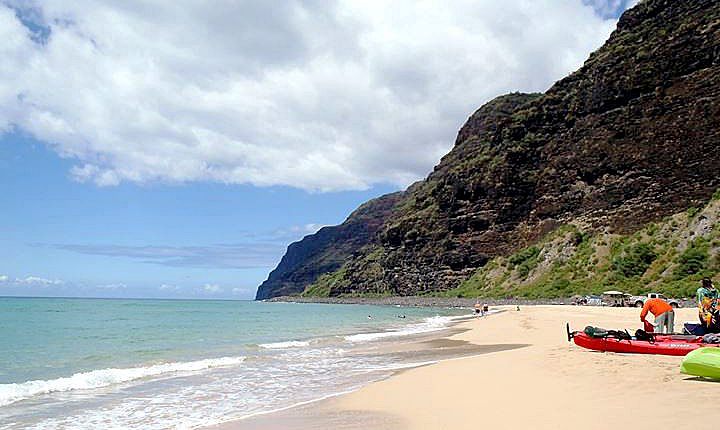 Polihale Beach and State Park is located at the end of Highway 50 and is accessed down a unpaved old cane haul road. The seventeen mile stretch of white sand beach and sand dunes offer endless beach-combing and shelling fun. Polihale Beach sits at the end of NA PaliCoast and the edge of the Mana Plains. This is a spectacular stretch of wilderness, with 100 foot sand dunes, desert cactus and remarkable sunsets over the Forbidden Island of Niihau. This is the last beach on the west side marks the beginning of the Napali Coast. Polihale Beach is hot and shade is far from the waters edge, so don’t forget an umbrella and lots of water if you plan on spending any time here. Polihale Beach has some facilities and camping is by permit only. Strong currents and no lifeguard make it is a notoriously dangerous beach for swimming. This is a great beach for shelling, long beach walks and spectacular sunsets.